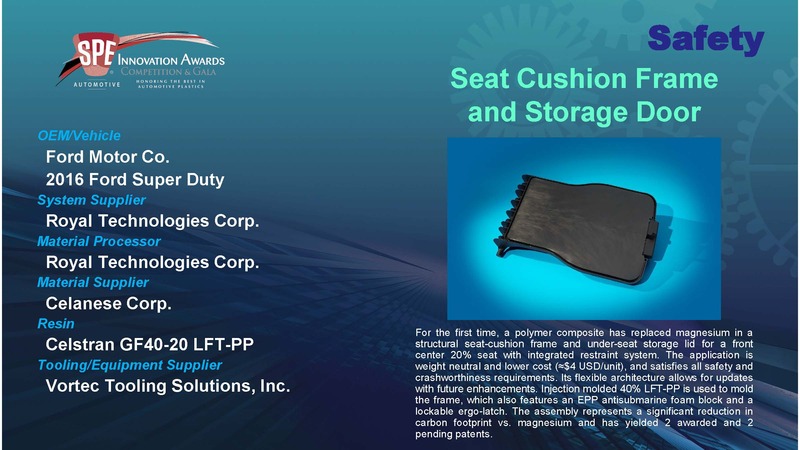 The Seat Cushion Frame and Storage Door on the 2016 Ford Super Duty pickup from Ford Motor Co. was the Safety Category winner in the 46th-annual SPE® Automotive Innovation Awards Competition. System supplier and material processor, Royal Technologies Corp., material supplier, Celanese Corp., and tooling/equipment supplier, Vortec Tooling Solutions, Inc. also were named on the award. 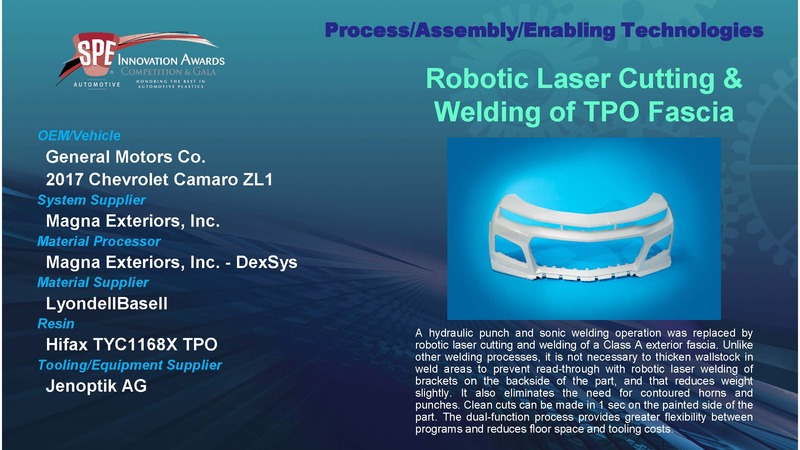 The Robotic Laser Cutting & Welding of TPO Fascia on the 2017 Chevrolet Camaro ZL1 sports car from General Motors Co. was the Process, Assembly & Enabling Technologies Category winner in the 46th-annual SPE® Automotive Innovation Awards Competition. System supplier, Magna Exteriors, Inc., material processor, Magna Exteriors, Inc. – DexSys, material supplier, LyondellBasell, and tooling/equipment supplier, Jenoptik AG also were named on the award. 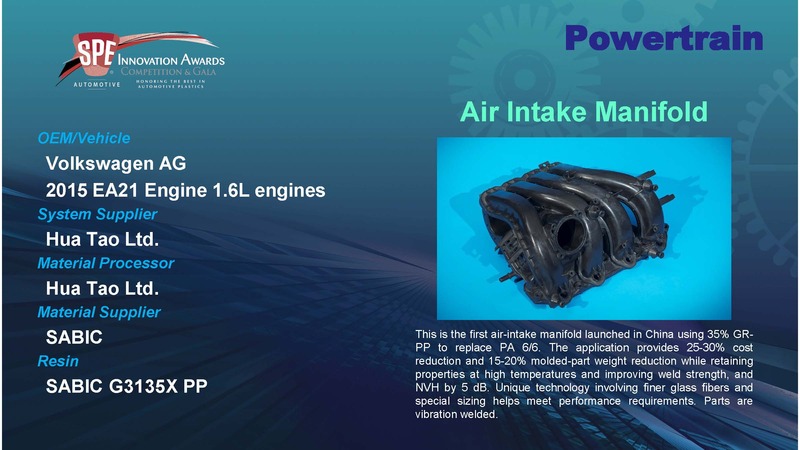 The Air Intake Manifold on the 2015 EA21 1.6L engines from Volkswagen AG was the Powertrain Category winner in the 46th-annual SPE® Automotive Innovation Awards Competition. System supplier and material processor, Hua Tao Ltd. and material supplier, SABIC also were named on the award. 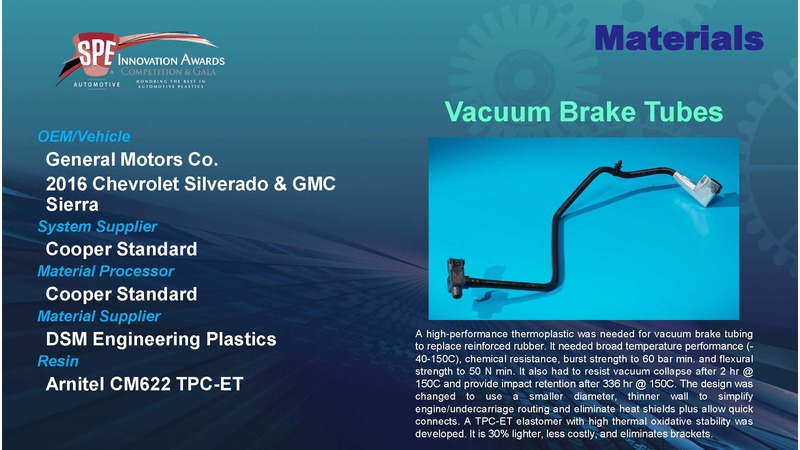 The Vacuum Brake Tubes on the 2016 Chevrolet Silverado & GMC Sierra pickups from General Motors Co. was the Materials Category winner in the 46th-annual SPE® Automotive Innovation Awards Competition. System supplier and material processor, Cooper Standard and material supplier, DSM Engineering Plastics also were named on the award. 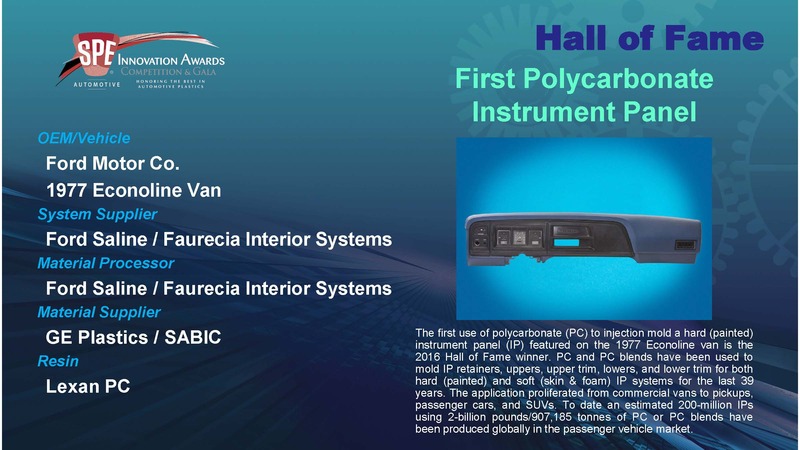 The First Polycarbonate Instrument Panel on the 1977 Econoline van from Ford Motor Co. was the Hall of Fame Category winner in the 46th-annual SPE® Automotive Innovation Awards Competition. System supplier and material processor, Ford Saline (now Faurecia Interior Systems) and material supplier, GE Plastics (now SABIC) also were named on the award. 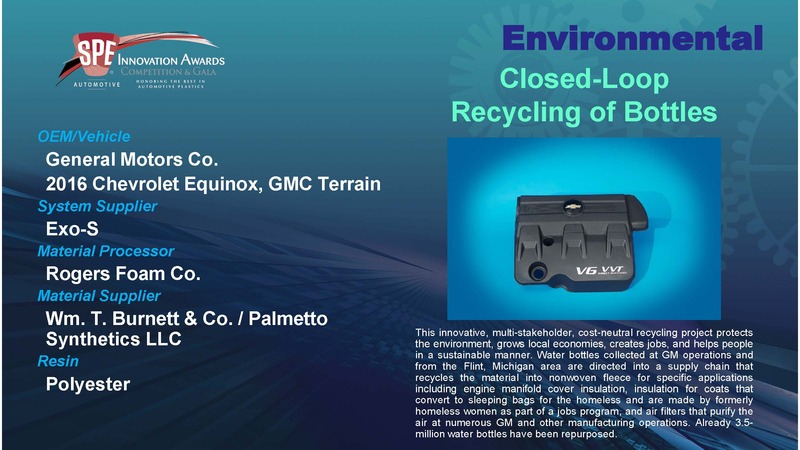 The Closed-Loop Recycling of Bottles on the 2016 Chevrolet Equinox CUV and GMC Terrain SUV from General Motors Co. was the Environmental Category winner in the 46th-annual SPE® Automotive Innovation Awards Competition. System supplier, Exo-S, material processor, Rogers Foam Co., and materials suppliers, Wm. T. Burnett & Co. and Palmetto Synthetics LLC also were named on the award. 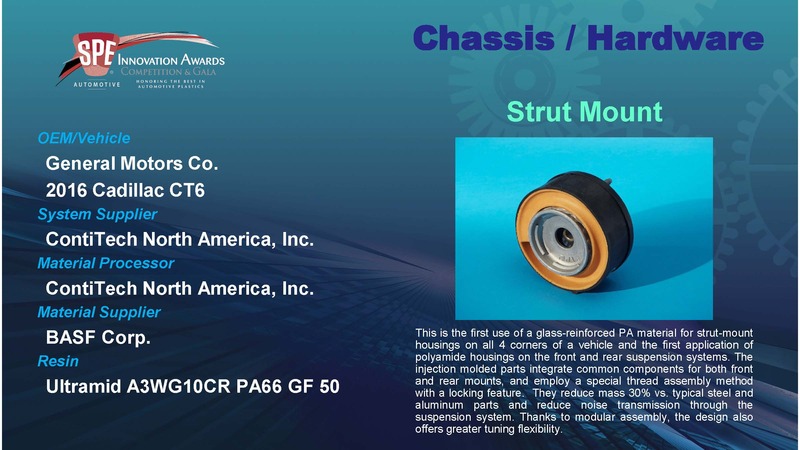 The Strut Mount on the 2016 Cadillac CT6 luxury sedan from General Motors Co. was the Chassis & Hardware Category winner in the 46th-annual SPE® Automotive Innovation Awards Competition. System supplier and material processor, ContiTech North America, Inc. and material supplier, BASF Corp. also were named on the award.